Merchandising with iPads is becoming increasingly popular, and specialty stands are a valuable asset to any business looking to be on the cutting edge. Unfortunately, the tablet stand market for the iPad Air is very limited. Displays2go offers stands that can be utilized within retail stores to effectively merchandise products. Set up an interactive kiosk for customers to use the iPad and learn more information about product and service offerings. 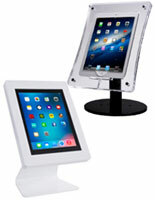 Countertop models are commonly used to set up iPads as a register stand. Air stands are also becoming increasingly popular at trade shows, conventions and expos. By creating interactive presentations for booth visitors, it's easy to engage and educate about a service or product without even having an employee speak. Using an iPad Air stand for promotional content helps sell products and build brand awareness without the need for a dedicated employee. Conventioners also use kiosks to allow customers to punch in their contact info and gain some new leads. Plenty of tablet apps are available that will help companies build a large database in a short period of time. While our selection focuses on stands for business use, some of these cases are also great for use at home! Wall mount displays are ideal for the kitchen to reference recipes or to watch a movie as you cook. The 3-in-1 model is perfect for on the go. The ring hook can be mounted on a wall for viewing and then easily taken off and held in hand for when you're on the move. The ring also works as a kickstand to sit upright on countertops! 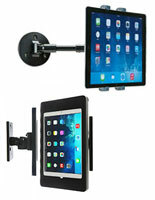 This versatile stand can be used in various ways throughout the home and is a must for iPad Air owners. Owning an iPad Air is already a great experience, but owners want to do everything they can to maximize that experience. 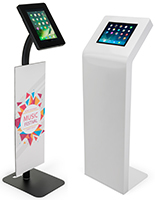 Retail stores and trade show exhibitors can benefit from using floor standing kiosks to help push a product or brand. 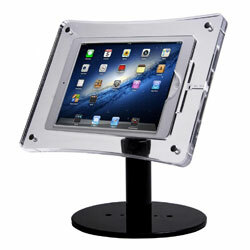 Also use countertop displays as a cash register to save space and improve workflow. Homebodies can greatly benefit from height adjustable stands for watching a movie on the couch and looking at recipes in the kitchen. Displays2Go offers a huge selection of products to give you the best tablet experience possible!